Last year I had the privilege of chatting with Elizabeth Henderson, a pioneer of the CSA model in the United States and an agrarian leader committed to resisting the many injustices of a cheap food system with the power of cooperation! 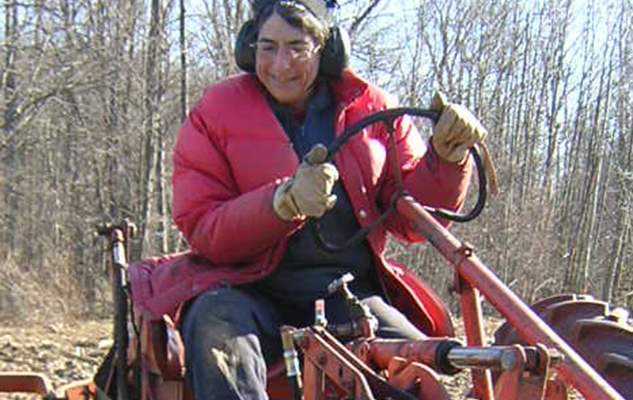 Liz co-founded the Genesee Valley Organic CSA in Rochester, NY in 1989, and later Peacework Farm in Newark, NY in 1998. 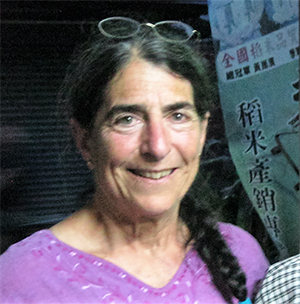 She’s the author of Sharing the Harvest: A Citizen’s Guide to Community Supported Agriculture*; the honorary president of the international CSA network, Urgenci; and a core leader behind the Agricultural Justice Project and its Food Justice Certification label. From the outset of our conversation, Liz took me to school, sharing advice, concerns, history, and visions; we talked about her Food Justice Certification label, the need for “smashing racism” as we build a new food system, and the minimum wage. Sara: It’s been nearly 20 years since Sharing the Harvest was first published, and quite a few food and farmer movement waves have unfolded since then. Where do you think farmers and activists have gained the best ground, and what challenges are most pressing? Liz: Well, there’s been a huge increase in the number of CSAs. At the same time, as you’d expect in a competitive capitalist society, someone will find a way to commercialize it and cheapen it. So there’s also been a proliferation of CSA-like food services. Some of these are really nice cooperative ventures with farmers sharing resources and setting up websites, as a way of cooperating and sharing markets. But a lot of these are just aggregators who are using the CSA image to make some money. Those aggregators are making it harder for CSA’s that are based on farms. They are providing a lot of competition, making farmers think “How can I make my project more convenient for people. Give them a choice every week? Ask for less of a time commitment? Deliver to people’s door?” That undermines the basic concept of CSA: sharing the risk. CSA’s are the only form where conscious consumers get to share the risk with their farmer or group of farmers. So, when farmers give up on that, they are giving up a lot. In our food industry, the biggest direct sales markets have gotten up to maybe 10 percent of what people are buying, and that’s in places like Vermont. But that still means that 90 percent of the food people are eating is coming from stores, super markets, buying clubs, food services. Now all these food hubs are springing up. Someone had the bright idea, “Ah, yes, we can aggregate!” But food hubs don’t guarantee a price that covers farmers’ costs of production, and they don’t ensure that farmers are getting a living wage and paying living wages. We haven’t figured out a way of doing those larger sales with a price point that allows family scale farms to thrive. Economics are still very, very challenging. Sara: So you’ve been on a team that’s developing a food justice certification label, the Agricultural Justice Project (AJP). How did the project get started? What will the label represent? So we started meeting a couple of times a year to figure out how we could keep fairness in organic agriculture. We started by sketching out what would be the standards for fairness in the relationships between the farmer and farmworkers and between the farm and its first market. Gradually, we extended the standards to cover entire food systems and have established a system of labels that distinguish between a fair company, a fair farm, and a fair food chain. Sara: What are your thoughts on the movement to raise the minimum wage and how farmers can engage in this effort? Liz: The issue of how much people are paid is a difficult one because it’s hard for farmers to get an adequate price for their products in order to pay the living wages that they want to pay. On the other hand [… ] if you make that a focus in your whole farm plan, it is achievable, and the farms that we have certified are able to do it. I’m not saying it isn’t difficult. It is difficult in a cheap food system. Richard Wiswall’s workshops on The Organic Farmer’s Business Handbook* are a great resource. But for the long run, we need to create a domestic supply of labor—people who are professional farmworkers, who are highly skilled, and who are recognized for the importance of that skill. 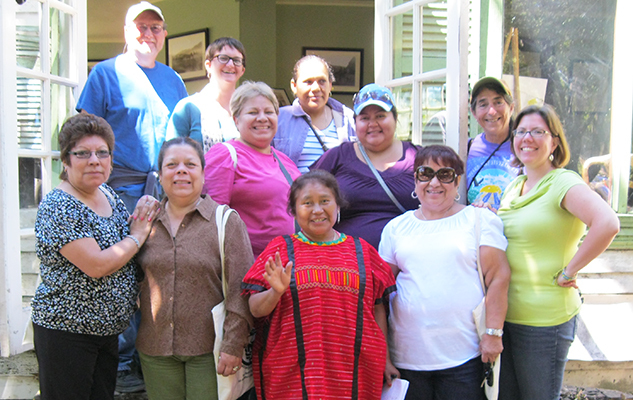 Elizabeth Henderson (far right, back row) with Agricultural Justice Project members and women from Lideres Campesinas. The food system in this country has depended on the supply of cheap labor from other countries for the past century. Before that we had slavery. That’s not a sustainable food system. That’s a system that uses up healthy young people, wears ‘em out, and tosses them away. That isn’t the kind of food system that I hope we’re trying to create, where we’re building sustainable farms that have sustainable livelihoods for a whole range of different kinds of people who are involved with them. 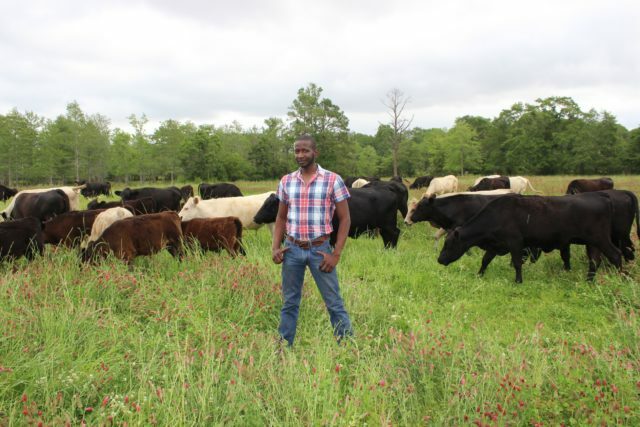 Sara: When I picture a future for myself in farming, I struggle with a main question: will I be able to build a sustainable farm business and still contribute meaningfully to the movements that resist structural racism and poverty in our society? What’s important about grappling to find this balance, and how have you engaged in social justice work as a farmer? Liz: I’m really delighted to hear that that’s something that concerns you, and it’s always been a big concern for me. Whenever it’s appropriate in my farming, I’ve tried to find ways to build bridges, like taking food stamps, having a scholarship fund so that we could have low-income families be a part of our CSA, getting funding from NOFA to teach CSA farms to use SNAP. But then also, taking the trouble to look around and see who else is out there. I’ve been going to the Growing Food and Justice for All (GFJI) conferences for the past six or seven years. GFJI is under the leadership of farmers of color, many of them urban farmers. In such an apartheid country, we need to look for ways of putting ourselves in alliance. Sara: Anything you want to close with as a message to young farmers? Liz: I hope I can count on young farmers to take part in the greater domestic fair trade movement that we are building, though I’m not sure what form that will take. But I know that we’ll be in communication and learn from one another. *Want to buy Liz’s book or The Organic Farmer’s Business Handbook? NYFC members receive 35% off at Chelsea Green Publishing.